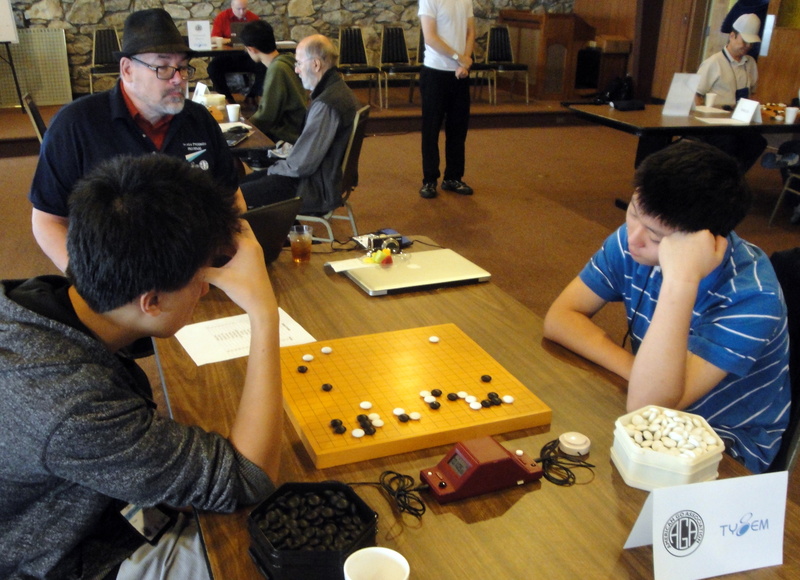 The American Go Association (AGA) Board of Directors approved the AGA budget for fiscal 2014 at its meeting on July 7; the budget includes funds for a pro certification tournament to be completed by the end of 2013. 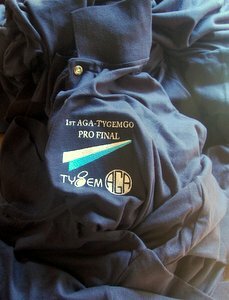 The AGA will continue to look for new sponsors to replace Tygem, but will run this year’s tournament from reserves and from money earmarked for the AGA’s new professional system. In other actions, the Board approved the creation of a pilot program for AGA ratings of online games, which would parallel the ratings system now in place for in-person games. President Andy Okun will be pursuing implementation plans along with completion of plans to issue formal Rank Certificates to players who have demonstrated achievement at a particular rank level. 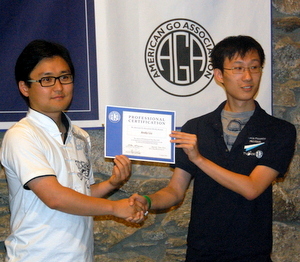 The first such certificates will be awarded to top finishers in most brackets at the 2013 US Go Congress. 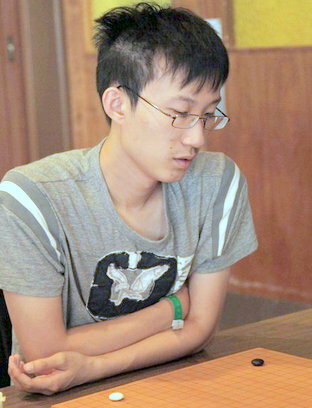 Additionally, Bob Gilman and Royce Chen have been authorized to investigate the feasibility of bringing a Cuban player — or players — to the 2014 US Go Congress. The Board will assess options for fundraising and implementing such an effort after the committee reports back. 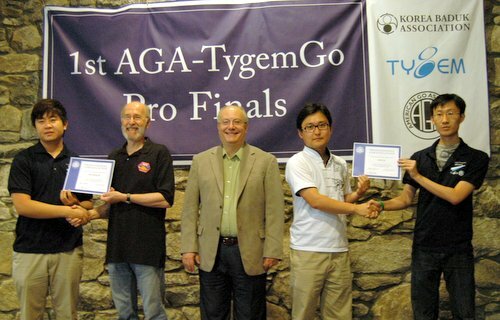 AGA Pro Tourney Game Records Posted: AGA-TYGEMGO Pro Tournament game records for both the main tournament and the Exhibition League have been added to the AGA Professional System page on the AGA website. To see the tournament draw – and download game records – scroll down to “Results.” Thanks to Dennis Wheeler and Steve Colburn for their work on this. 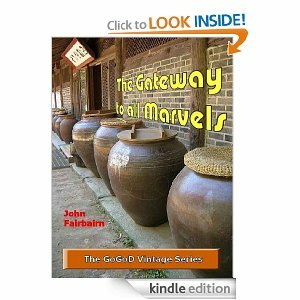 GoGoD Publishes Chinese Classic in E-Book Form: GoGoD has issued another e-book on Amazon: Gateway To All Marvels. Gateway is special edition of the 1347 Chinese classic Xuanxuan Qijing (Gengen Gokyo in Japanese), which John Fairbairn says “is surely the most significant go book ever produced. It has become the foundation for virtually every problem book since, as well as being the main source for early go theory.” The new e-book version “brings together every problem and every variant from perhaps every subsequent edition, and discusses how the almost 500 problems and their solutions have evolved and varied, and also how even modern professionals often disagree on the correct solutions or, dare we say it, trip up,” Fairbairn adds. 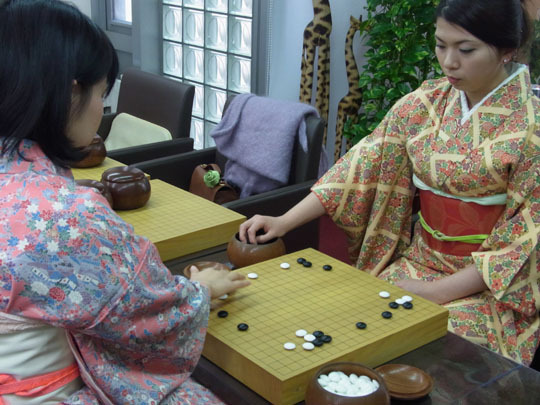 Previous GoGoD e-books include Inoue Genan Inseki and The Life of Honinbo Shuei, also available on Amazon. Go Mention in Stevie McCabe Mystery: “Go is mentioned in the fifth novel in the Stevie McCabe mystery series, No Shadow in the City by John Callaghan, a Scottish author,” reports Su Co Chon Duc (Marjorie E. Hey). “In Chapter 4, there are several pages introducing go to the private investigator, Stevie McCabe. It is mentioned again in passing in Chapters 6 and 29. There’s some mayhem, but there are no ripping viscera, no splintering skulls. Yes, there are sexual encounters, because the characters have real lives, but no lingering erotica. It is marked for For Adults because of language.” While the first four books are available in paperback and Kindle format, Su Co Chon Duc notes that this book is currently only available on Kindle. Nice Go: Bob Barber reports that go pops up in “Mr. Nice,” a 2010 film about a Welsh drug dealer. “There’s a minute of go at minute 19,” says Barber. Here are the full results of Friday’s games from the AGA-TYGEMGO Pro Finals. The name in ALL CAPS is the winner (color played, next match). For latest standings and game records, click here and scroll down to Results. 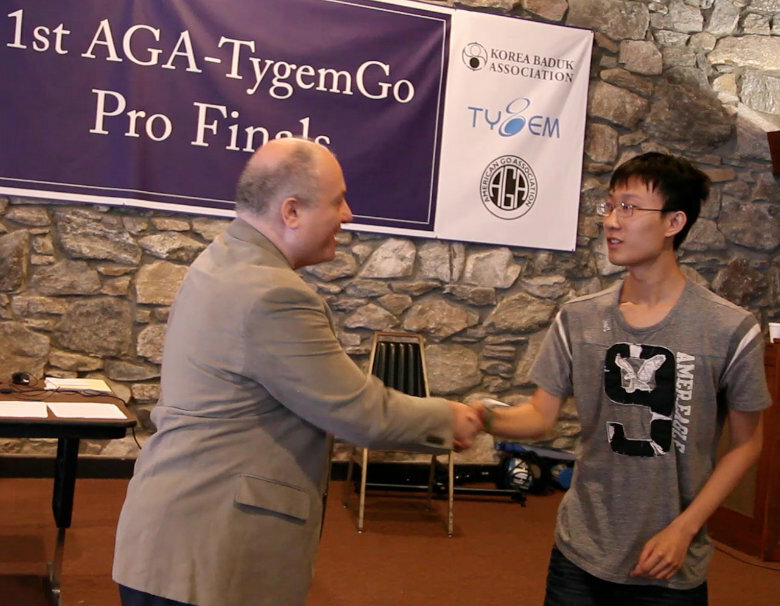 Here are the full results of Thursday’s games from the AGA-TYGEMGO Pro Finals. The name in ALL CAPS is the winner (color played, next match). 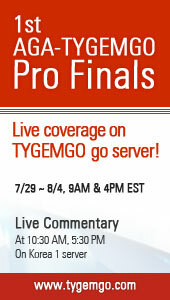 NOTE: Myungwan Kim 9P is doing live daily game commentaries at 10:30a and 5:30p EST on the TygemGo Korea1 Server; some games are also being broadcast on KGS. For latest standings and game records, click here and scroll down to Results. 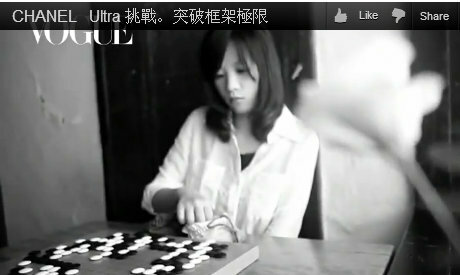 Exhibition League: SURPRISE EXTRA ROUND! 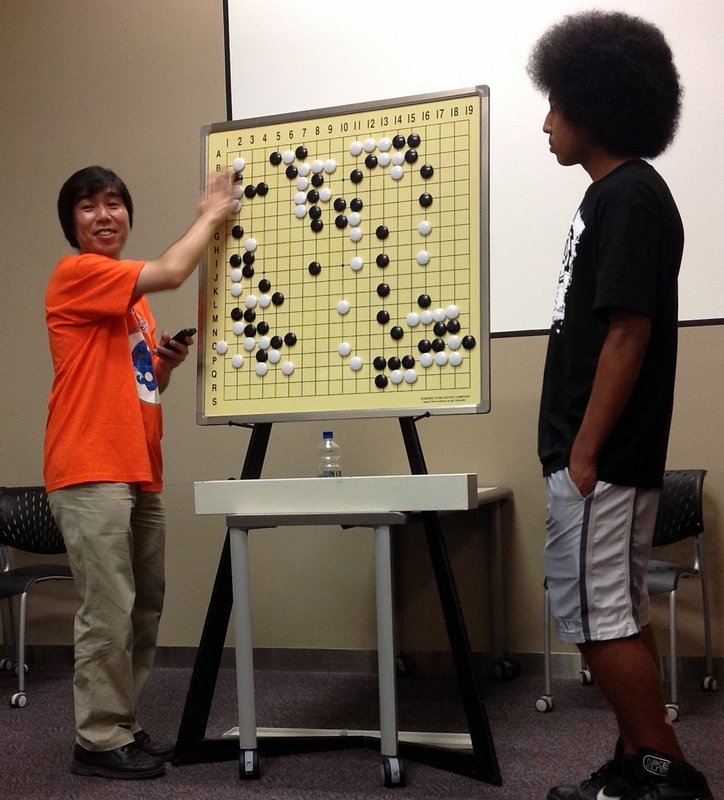 Results of Wednesday’s games from the AGA-TYGEMGO Pro Finals. The name in ALL CAPS is the winner (color played, next match).